A stunning print of the iconic 'Windows in the West' painting by Avril Paton. 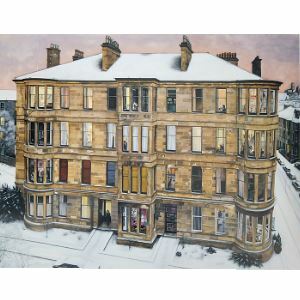 Bring a small bit of Glasgow life into you home with this print of the iconic painting depicting tenement life. Presented in a card mount suitable for framing, this reproduction is printed with exceptional detail and on high quality art paper. 'On January 11th 1993 at about 5:30pm, there came a sudden heavy blizzard. In ten minutes it was over and the view from the attic window at Athole Gardens overlooking Saltoun Street was transformed. The lilac pink sky, the lit windows, the clarity of whiteness where there had been darkness - it was magic. By morning all the snow had gone and the effect was never to be repeated during that winter.